Wild populations of the Blue-winged Macaw (Primolius maracana) are declining due to habitat loss, capture for the cage-bird trade and persecution as a crop pest. Project progress: WPT collaborated with American Bird Conservancy to fund a study on the ecology and conservation of the Blue-winged Macaw in a forest fragment in SE Brazil. 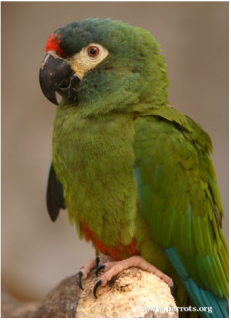 Outcomes: The Blue-winged Macaw has been seen at various protected areas in Brazil, but some areas where it is found, such as Serra do Cachimbo and the Serra Negra Biological Reserve, are unprotected or tiny (Sierra Negra is a tiny 10 square km reserve) (Wege and Long 1995, Clay et al. 1998). Results of work from other sources suggests to gather together current data to provide an improved assessment of distribution and status, and to monitor known populations to assess further declines. The full impact of the wildlife trade is not currently known, and must be researched. Where found: Found in E Brazil at Ilha da Marajo, Para, and S Para and Maranhao south to Mato Grosso, Sao Paulo and formerly Rio Grande do Sul, and scattered through E Paraguay to NE Argentina. History: Blue-winged Macaws (Primolius maracana) are found in mangrove forest and cerrado in Marajó Island, Pará, over most of Brazil to Paraná and nearby parts of Paraguay. They formerly occupied a huge range in Brazil, Paraguay and Argentina. They have since undergone a decline (Chebez 1994, Juniper and Parr 1998). There have been no sightings in Argentina where it is thought to be nearly extinct (Bodrati et al. 2006). In Brazil this species is found in a wide range of habitats and is still considered to be widespread, in areas that are largely protected by the Brazilian military. It has been persecuted for the wild bird trade and as a crop pest. Ecology: The Blue-winged Macaw is found up to an altitude of 1000m (3280 ft in tropical and subtropical evergreen and deciduous forest, including Atlantic rainforest and cerrado savanna; prefers forest edge or areas close to water. In N Bahia birds are found in gallery woodland in caatinga zone. Birds take seeds of introduced species Melia azedarach in NE Brazil; other details on diet are lacking. They prefer to stay in one area, occur in pairs or small groups, and are less conspicuous than larger macaws. They avoid flying across open country, opting to instead fly amongst trees.